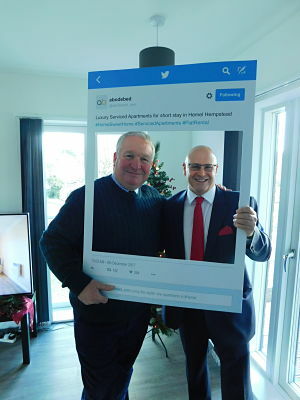 The Hemel Hempstead MP, Sir Mike Penning, made one of his first official outings after being knighted at Buckingham Palace to our Festive Coffee Morning. We were also delighted to welcome the Mayor of Dacorum, Councillor David Collins. The main aim of the morning was to raise money for The Hospice of St Francis, and we achieved this with a brilliant £300 from the sales of raffle tickets for prizes ranging from a bottle of Prosecco to a Haven leisure break. Abodebed is a corporate sponsor of The Hospice of St Francis and wanted the coffee morning to raise awareness of the valuable work of the Hospice as well as fundraising. The Festive Coffee Morning was held at one of our new Premium serviced apartments at The Oval. Click here for more details about our Premium range.